Publicare is specialized in email marketing, online marketing and database marketing. They can help you select and maintain the right ESP, deliver email full service and provide marketing automation services. Which they do for global corporations as well as medium-sized national businesses. Publicare manages accounts that send over 1 Billion emails per month. Headquartered in Frankfurt am Main, Germany, Publicare also has a second office in Rochester, NY. Among Publicare’s clients are eBay, Citrix Systems, Motorola Solutions, Kaspersky Lab and AirPlus International. Are you looking for an Publicare alternative for your email marketing? We listed some Publicare alternatives. 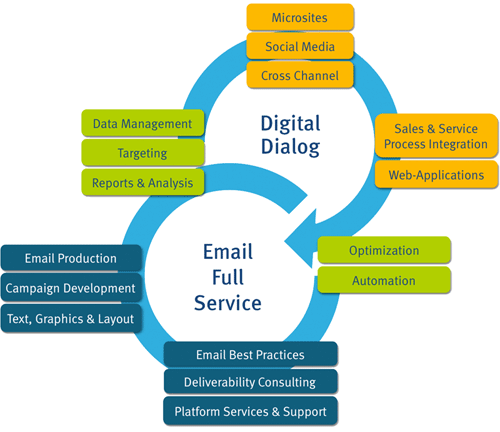 With a decade and a half of providing email full services Publicare understands that out-of-the box solutions are not the answer for companies that emphasize meaningful communications with their customer base. Publicare designs and implements tailor-made solutions for its clients – on any platform – for a seamless and engaging communications experience. Publicare finds the platform best suited for its clients and manages the setup, integrates the platform with its clients’ CRM systems and supports users at every step of the campaign cycle. Publicare's strength is working with clients targeting their international audiences, providing services as a one-stop-shop and creating and executing communication strategies across countries (and languages). Automated lifecycle campaigns, transactional emails, and integrated event communication are ideal to create a meaningful dialog with customers. Publicare helps its clients identify the best contact points with their customers based on their customers’ previous behavior and set up effective campaigns. On both a national or international level, Publicare uses its experience to form and constantly enhance their best practices. They also ensure that the newest available technology is at their clients' disposal to be one step ahead of the competition with dynamic, responsive, personalized, and engaging campaigns.